The Vampire Diaries off-screen drama is reaching fever pitch as Ian Somerhalder has reacted to Nina Dobrev’s taking a new boyfriend rather predictably with jealousy. Ian Somerhalder and Nina Dobrev have always had a contentious relationship on The Vampire Diaries but now this tension has turned to jealousy and animosity in real life! 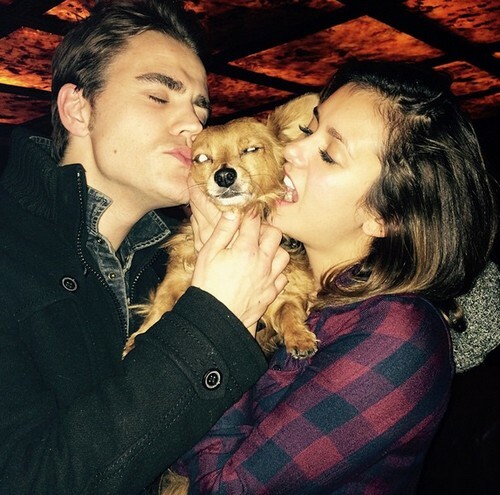 What is more contentious than a love quadrangle involving Ian, Nina, Nikki Reed, and Nina’s new secret boyfriend? We’ve been hearing from several sources that Nina Dobrev has been seeing a new guy, even though she’s kept the identity of the guy secret. Granted, it makes sense – Nina’s young, she’s single, she’s famous, she’s beautiful – and I have a hard time believing that she’s staying at home and reading her scripts while Ian is out, frolicking around with Nikki Reed for the whole world to see. However, we’re hearing that since Nina and this mystery man started hooking up, Ian’s been having second thoughts about his relationship with Nikki Reed. Apparently, old feelings of jealousy started to creep up on him, and he couldn’t help but wish for Nina Dobrev back. But since a Nina Dobrev and Ian Somerhalder reunion is never going to happen, he’ll just have to settle for wishing her new boyfriend gone instead. But now Ian will know what Nina felt like when he flaunted his relationship with Nikki in everyone’s faces. It’s not so bright on the flip side, is it? What do you guys think? When will we see Nina go public with her new relationship and who do you think Nina’s new boyfriend is? Do you believe that Ian is jealous of this mystery man – will his discovery increase tension on The Vampire Diaries set or affect either of the star’s decision to sign on for a season 7 of TVD? You know Nikki Reed will be upset with Ian Somerhalder’s jealousy, right? Let us know your thoughts in the comments below. Does Nina Dobrev Have a Secret New Boyfriend: Mystery Man Hidden From Ian Somerhalder?